Thank goodness it didn’t leak all the fluid and lock up the transmission while I was driving it. There’s no damage to my transmission as far as I can tell. I’m so glad I was HOME and not three hours away, like I was this weekend. I’m happy my husband saw the fluid leaking instead of just having transmission problems and trying to figure out what was going on. My insurance covers towing, so I’ll get $50 back. Yippee! So, instead of thinking how bad things are, think of how WONDERFUL life is. I just told a lady that life is so good and she replied “For you it is.” I truly believe life can be super for all. I set a goal to come in at least third in my age group at the triathlon this weekend and I DID IT!!! I’m so happy because this is the only time I’ve placed in my age group when there have been more than two folks in my age group. I came in 3rd out of 5 women in my age group, so I’m darn tickled! I finished the sprint distance race (1/2 mile swim, 12.5 mile bike, and 5K run) in 1:37:53. I do have to give props to my 9 week training guide from The Woman Triathlete book. I followed it about 85%, just missing a few workouts. I only did two bricks during my training this time, so next time, I’m going to do some more work there. I felt so strong on all three legs and I even beat a 30 minute 5k time (which is big for me). I had a blast, and I’m going to train even hard and compete in the Claytor Lake Tri on September 14. But, I’m going to take a couple of weeks and just have some fun first. My husband and I spent a night in beautiful Warm Springs, Virginia at a place called Natural Retreats. It was a great place to stay, even though we’re from the mountains. It was SO relaxing and quiet on that old farm, and we practically had the place to ourselves for most of Friday evening. There was no noise that night, just some tree frogs in the distance. We had a fantastic supper at the Inn at Gristmill Square. Fresh, local trout stuffed with spinach and mushrooms, then topped with asparagus and walnuts. The rolls and peach Bellini were yummy! Enjoy some pictures from our fun weekend in Bath County. AND, set a goal for yourself…you might just be surprised at the outcome! The 1860’s farm house with the nice, new pool out front. Me and my dad about 30 years ago. 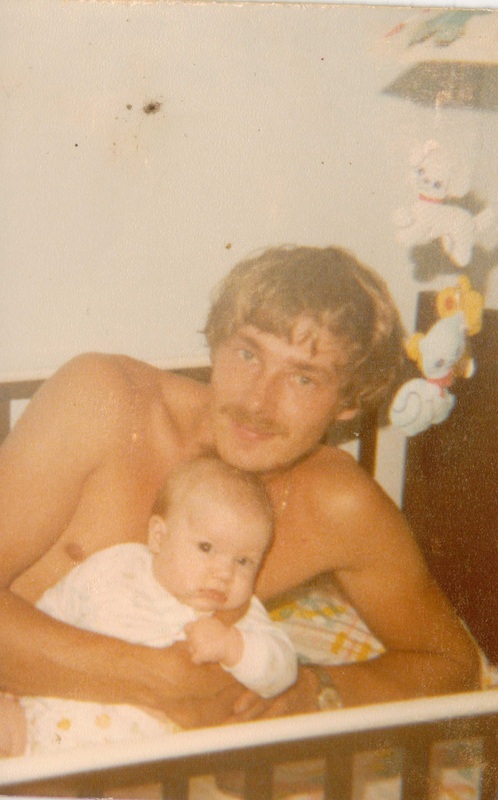 I find it amusing that my dad was in the crib with me in this photo and the thing didn’t cave in. I think at the time, he weight a whopping 150 pounds or so. I guess cribs back then were made a little more sturdy than now. I’m not going to even try to see if my son’s crib can hold me. I’m so thankful to have a wonderful dad. He’d do anything for me and give me anything I asked for. But, he’s not spoiled me, if that makes any sense. He loves his grandson and my sisters the same way, too. He’s always there if we need him. I’m also grateful for a wonderful husband who is a fantastic dad to our son. He’s leading him in the right way by spending quality time with him as well as making sure he goes to church and lead a Christian life. I’m thankful for my father-in-law who treats me like his own flesh and blood daughter. He’s gone above and beyond to treat me well these past 11 years. Most of all, I’m thankful for my Dad in heaven. The One who created me. The One that gives me the hope to live each day. The One who provides for my every need. I hope you have a special man to spend Father’s Day with. Most of all, I hope you know my Dad personally. He’s your Dad, too. Our church had planned a trip for the kiddos to Tweetsie Railroad today and I was bummed when we couldn’t go due to LOTS of rain and potential flooding. But, then I remembered we have an animal park just a short drive from our house, and I convinced my husband that we should take our son today. So, we set off on our adventure, and our son fell asleep on the way. This was good, because he’s happier after a nap! Neither one of us had been to the Shot Tower, even though we’ve lived near it our whole lives, so we took turns going up to the top while one stayed with the sleeping boy in the car. It was neat and educational. Then, we traveled on. We thought we’d let our son sleep a bit longer, so we went to what used to be the neatest local shopping mall in the 90’s. It had a “Nothing over $10” clothing store that we all loved, plus tons of other outlet stores. We drove up to that mall and it was absolutely closed! We were so bummed. It was like the end of an era. However, on the way to the outlet mall, we discovered a diamond in the rough! I’ve always seen this mansion on the side of the road, but now it’s open for tours and has a neat restaurant in it. The restaurant is called “Key Ingredients” and has a lot of fresh, local food. The cook didn’t claim to be a chef, but he was darn good at preparing a delicious lunch. And, we finished it off with a brownie sundae that was out of this world. It was topped with local, jersey cow milk ice cream. Yum! We didn’t do the mansion tour, but I’m sure we’ll go back another day for that. We finally made it to the animal park and we had a great time. We were a little saddened to see some of the monkeys and birds in cages, but I’m glad they were outside with fresh air and sun. The bus safari ride was neat, because we got a private tour. It included zebras, camels, wildebeests, ostriches, water buffalo, pot bellied pigs, and a ton of turtles! We really enjoyed that bus ride. All of this took place in big, old Fort Chiswell, Virginia. When we tried to 4-1-1 the number to the animal park, it came up as Max Meadows, VA. If you have a chance and are traveling through southwest Virginia, make a stop. It’s worth it. And, there’s a fish hatchery on the same road as the animal park, but we didn’t make it. That leaves us an adventure for another day! Next time you’re “bored” or don’t have something to do, check out your own “backyard”. You might be surprised what you discover! These were only a handful of the turtles! Peonies have to be my favorite flower. I love their delicate, paper thin petals and their sweet, soft fragrance. I have one growing at the end of our driveway, but it only has two blossoms. Across the road, there is an abandon house where I pick their peonies. Today, my son and I picked a few and put them in a pint jar on our table. The ants like them, too. We ended up with a few ants in the house, but who cares?! My husband and I sat on our porch until after 10 pm last night just talking and watching the sun go down. The lightning bugs came out for a show and the whiporwill sang her unmistakable melody. Made a cake called “Preacher’s Delight” today. I’ve been craving pineapple and coconut (no, I’m not pregnant), and I found this recipe. Oh, my. It hit the spot and is SO good! I used coconut cake mix instead of white and I mixed crushed pineapple into the cool whip. I think next time, I may use pineapple cake mix. I’ve not been eating sweets during the week, but I’m allowing myself sweets on the weekend. Trying to lose a couple of pounds before my triathlon in a few weeks as well as show sugar I’m boss! I shaved 5 seconds off my 100 yard freestyle time! I had timed myself a month ago and then timed myself again this week and I’m 5 seconds faster than before. This 9 week tri training program is working well! Lots of intervals, but it’s making me stronger and faster, I can tell. Only 3 weeks till the triathlon. I have to do some bricks in the next two weeks to get my legs ready. My 16 month old son ate broccoli and LIKED IT! I got him on video eating, smiling, and yumming so I can convince him later on down the road that he DOES like broccoli. Oh, and I took a bath with my son and a peony today. He had picked one and decided to take it to the bath tub. It held up really well! Well, that’s enough for today. I’m going to finish this evening sitting here on my porch, watching the cat eat and listening to the birds as they wind down for the night.